There are a lot of great features on LinkedIn. It’s a great way to connect and network, to find great information and it’s a great way to get social proof on whether someone is worth working with. Because of that last point I think the recommendations and endorsements are really key. 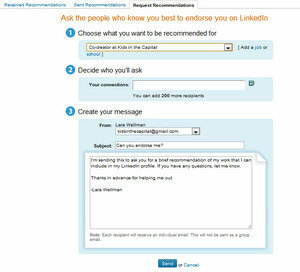 Recommendations are the equivalent of testimonials on LinkedIn. They are given by people who have taken the time to write out why they have liked working with you, working for you, or having hired you. 2) Ask people who have given you recommendations if you can use them in other marketing materials and on your web site. 3) Give recommendations to others. This is not only a nice thing to do, it will often encourage the recipient to do the same for you. 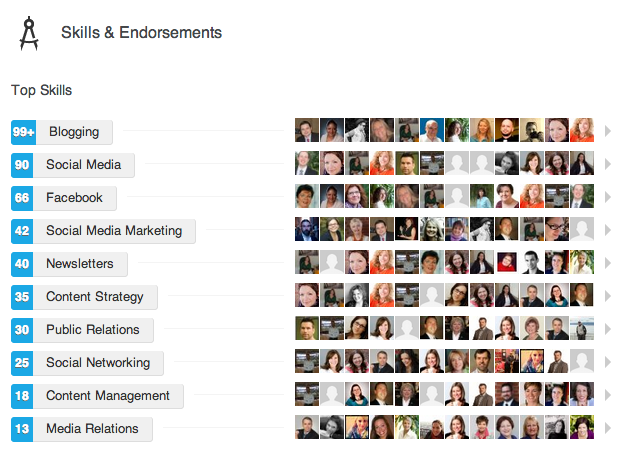 Endorsements are a way to tell people what you do and prove that people know what you do. You set up a list of skills and people will click if they agree that you do that. It is important not to think that these are testimonials. Most of the people who endorse you haven’t even worked with you. Instead it is a way to know if what you’re putting out into the world is what you want. The important thing is to take it all with a grain of salt. People will likely endorse you for things they’ve never seen you do, or for things you don’t even do. Take it as an overall measure of what you’re projecting to the world. For example, if you are a mortgage broker and you are being endorsed for planning events then you need to figure out how to put more information about your ability to help with mortgages. If you have skills that you wish weren’t there at all (maybe someone added them or you’ve changed your focus) you can edit them. 1) Make a list of 3 people you could write a recommendation for. What are the key points that you would share in a testimonial about them. Go write them now! 2) Go to LinkedIn and endorse 5 people. Leave us a comment here or on Facebook to let us know you did it! One of the features of LinkedIn I’ve always really liked is the ability to give and get recommendations. I did some reading about and played around with the feature this week to get a bit more insight to share with you. People check out your recommendations - it’s one of the most interesting parts of your profile to check out, so getting some is worth your time and effort. 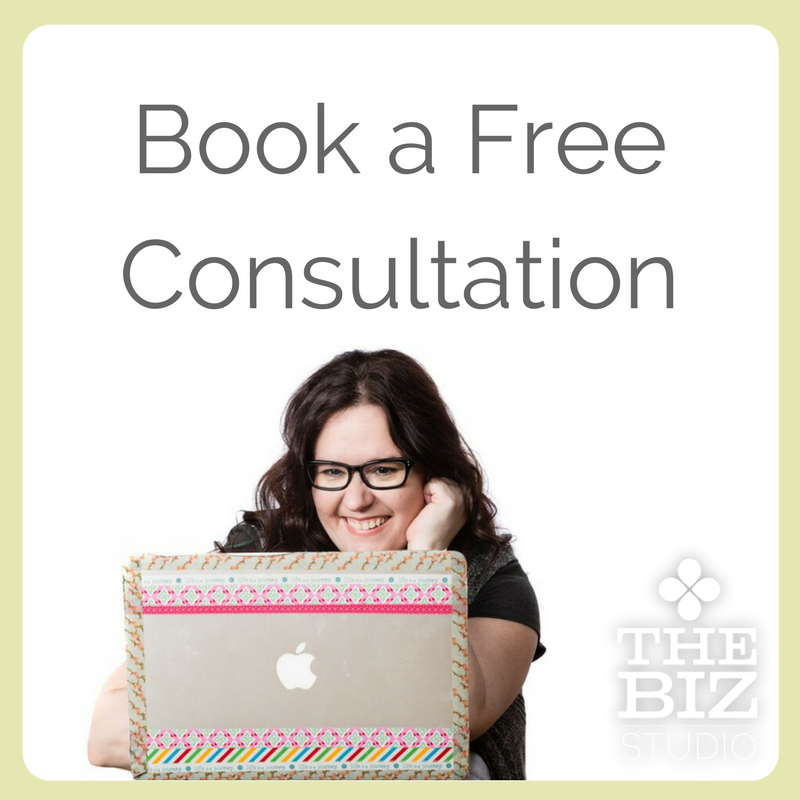 It’s okay to ask for recommendations (and you should!) - they’ve made it really easy to do so. Ask for specific recommendations. Mention a specific project you worked on together, or the kinds of topics they might cover. People don’t want to have to think too hard about what they might say - make it as easy as possible for them to say what you hope to hear. Don’t forget to give recommendations. There are several reasons for this. It might make people want to give you one back. People read recommendations. If they are looking at someone’s profile they might click through to you based on the recommendation you gave someone else. Clean up your recommendations from time to time. I had one recommendation from someone from 2008 that I never even met but only had some casual online in. I teractions with. I also don’t do much of anything related to the position she recommended me for. I decided to get rid of that recommendations to make sure the ones I want seen are more prominent. Don’t go overboard. Having 200 recommendations is a bit over the top and also a waste. Ask select people or a variety of types: bosses, colleagues, staff, suppliers, volunteers, etc. This will give a nice rounded mix of all your experience and expertise. Have you cleaned up your profile yet?